While some people may view hourly engine room checks while underway an interruption to the fun of cruising, my wife Maria and I actually embrace the activity. Lets face it, theres not a whole lot else to do after you have cleared the inlet, set your waypoints, and turned on the autopilot as you cruise along at 6 knots except to keep a watchful eye out. Standing watch high up in a pilothouse is part of the magic we enjoy being out at sea. It doesnt matter if were heading out for a weeklong trip or just going out for a few hours, this enjoyment comes with responsibility that we do not take lightly and includes ensuring that all systems are functioning properly. The last place we want to deal with mechanical issues is 25 miles offshore. 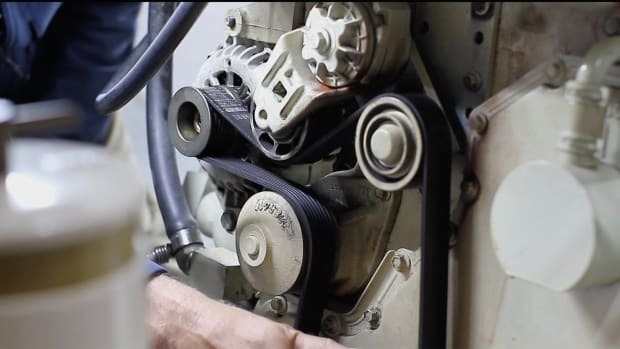 To help us minimize this possibility, we adhere to a detailed preventive maintenance schedule on Maria Elena, our 2007 Nordhavn 40, plus hourly engine room checks to help us spot potential problems long before they become major issues. Our hourly checks start in the pilothouse recording date, time, and GPS location followed by the basic engine instruments including hour meter, oil pressure and temperature, engine temperature, voltage, RPM, and speed. After this information is recorded I head below to the engine room for visual inspections and temperature readings. During this time Maria stays in the pilothouse and keeps watch (its essential, and mandated by law, to keep a good lookout at all times). If she needs me in an emergency she will simply increase or decrease the throttle setting which tells me something is up and I need to return back to the bridge. Prior to entering the engine room I always look through the deadlight in the engine room door to make sure there are no signs of smoke or fire. On one passage a few years ago we blew an exhaust gasket on our dry stack exhaust and the room was very hazy. At first I thought we may have had the beginning of a fire, but soon realized what had occurred and took the appropriate action. Being able to see inside the engine room prior to opening the door prevented me from adding fuel (in this case fresh air) to a potential fire. After donning hearing protection I enter the engine room and start both audible and visible inspection of the main engine. While many people may question the ability to learn anything from the sound of an engine I can honestly say that you can. Our Lugger diesel engine has its own unique rhythm when warmed up and running that doesnt change except when RPM is adjusted. Visible inspections include the transmission, fuel valves and lines, hydraulic system, and propeller shaft coupling for appropriate dripping. After all the visual inspections are completed I use our inferred pyrometer and start taking temperature readings. I take 10 different readings (click here to see PDF of chart) that cover all vital systems aboard. Once the readings are recorded I return to the pilothouse and compare the new data to previous inspections and look for unfavorable trends. Diesel engines take a little time to reach normal operating temperatures and understanding their temperature in relation to running time and RPM are important to avoid potentially serious damage. Another critical system that requires timely attention is the main engine propeller shaft stuffing box. Unlike some systems, a conventional stuffing box can overheat within 30 minutes of running time, or less, if it is adjusted too tightly. Dripless stuffing boxes can also overheat very quickly if their flow of cooling water is compromised. We take temperature readings at both the coupling and shaft to ensure we are running at the correct temperature based upon engine RPM, water temperature, and duration of the cruise. After our trip is complete, I enter the handwritten data into an Excel spreadsheet and plot the data by system onto a graph. The graph provides Maria and I with a nice visual showing trend data that we save and use to compare against other cruises. Some interesting observations we gathered from the data include the effects of running with and against current, a clean versus dirty bottom, and variation in water temperature. One additional benefit to maintaining good records was evident when it came time to sell the boat. Being able to show prospective buyers this level of detail on the operation of the boat provided them with a good sense that we cared for and maintained the boat to the highest standards. It also helped the new owner from day one understand what was normal and abnormal with all major systems. As we look forward to our third Nordhavn we know one thing for sure, those engine room checks will be top on the list of things to do during our maiden voyage! John and Maria Torelli have owned and lived aboard two Nordhavn trawlers the past five years in San Diego, California. They recently published a book entitled Life Is a Journey, Why Not Live It Aboard a Trawler available on www.lulu.com.